Funding cutbacks continue to plague arts organizations, such as Coral Gables Opera. Small, innovative organizations suffer the most. Each year, for the past 8 years, we have been able to secure sufficient funding to cover the costs associated with the production of the concert, i.e. venue and musicians. More 2000 Miami-Dade County school children have been transported to the venue for a performance of classical music, something they rarely hear at home. The concert is recorded and edited by Coral Gables TV and shown on WLRN channel 17, the PBS station serving the Greater Miami area as part of their summer programming. For 2013, we will need corporate support to cover reduced funding from Miami-Dade County for this production. 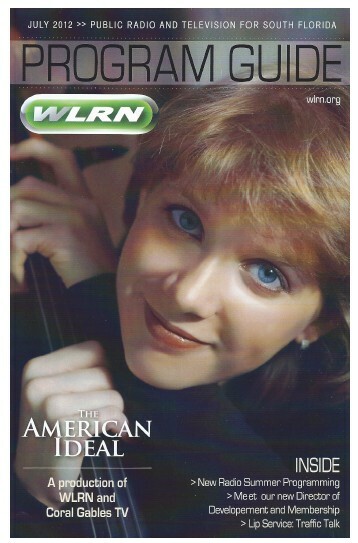 Each performance is a showcase for several young classical musicians, such as Ana Litvinenko, 18, (pictured on the cover of WLRN’s July Program Guide) who first performed at the age of 13 and an opportunity for a couple of adult opera singers (ages withheld) to gain stage experience, as well as TV and internet exposure. Check out our YouTube channel to see recent performances. All donations are appreciated. We can provide website and social media exposure, as well as on site recognition and listing on the credit for the production.